The mysterious ‘underground tunnels’, the bastion passages form a part of the defence system of the bastions and were built as a part of the bastions in late 17th and early 18th centuries. There are other tunnels from the first half of the 17th century, e.g. the old Wismar Ravelin passages from the 1630s and more passages inside other fortifications. When cannons and firearms were introduced and became a staple of warfare and sieges, also the fortifications had to develop accordingly. As walls were vulnerable to cannon fire, the fortifications became lower and wider, ditches and earth ramparts were used that would absorb and disperse the energy of cannon fire. As early as already back in 1530, a roundel was heaped up at the bottom of the Kiek in de Kök battery tower. Throughout the 16th and 17th centuries, more earthwork fortifications were built, the peak time of these structures over here being the 17th century, during which close to 30 different earthwork fortifications were added to the defence belt of Reval: roundels, ravelins, redoubts, semi-bastions, and finally, most advanced angular, geometrical bastions that formed part of a larger system. The Ingrian and Swedish bastions were built as a part of a colossal fortification plan devised by Eric Dahlberg (1625 – 1703), a prominent Swedish military engineer and architect. As his plans kept changing over the years when he returned to Reval for further inspections, we may say the complete plan consisted of 11 of 12 regular bastions with symmetrical faces and flanks encased in massive stone scarp wall interconnected with passages protected by curtain walls, and between and in front of the bastions ravelins, redoubts, then stone encased counterscarp walls at the outer side of the moat. According to the plan, cannons were mostly outside, at different levels on top of the structures. The construction work started in 1686. Due to the problems encountered while building these fortifications – political disagreements, financing, finding labour, war breaking out – only three bastions were completed by the time Russian Czar Peter the Great laid siege on Reval during the Great Northern War in 1710 and conquered this city. The bastions were never used for their intended purpose, i.e. to defend the city. The passages are casemated, but do not have embrasures, just air holes (soupiraux). The passages or galleries are tracing the outer edge of a bastion on the inner side of the massive scarp wall and the curtain wall in-between the passages. The casements are vaulted and are underneath a layer of soil that is several metres thick. They have been built on the top of the ground, but as the street level is a bit higher nowadays as well as the passages are covered with such a huge mass of earth, people tend to refer to these as ‘underground’ passages. The main purposes of these passages were to shelter the troops defending the city and curtained access from one defence structure to another, and to conceal from the enemy the redeployment of troops from one site to another. It also functioned as a storage space and was an easier way to move ammunition and equipment from one place to another. In case the enemy succeeds to breach the wall and infiltrate the bastion, the casemated structure of these passages helps against direct enemy fire and so to slow down the enemy advancement. In addition, using cleverly constructed device, it helped in reconnaissance by warning about any advancement of enemy troops or excavation activities. The massive walls surrounding the passages and the vaulted ceiling (barrel vaults) are made of limestone. The galleries itself are about 1.5 m to 2.5 m wide and 2.5 to 3m high. The scarp wall is over 3 m, in places almost 4 metres thick. At the ends of bastion flanks and faces vertical passages, some of these with steep steps, lead up, providing access to the levels above. Adding up the passages known to us in different fortifications, we get about 1.3 km; however, these passages are not continuously connected. Right now, a total of 470m has been renovated, but not all of it is available for visitors. As the bastions and the passages thereof were never used for their intended purposes, already back in the 18th century they were mainly used for storage space. After the Crimean War, in 1857 the Bastions were no longer listed as military sites and local municipality founded parks on top of these man-made hills. The passages were completely abandoned, yet from time to time the adventurous managed to get in through some opening and explore these, giving rise to countless stories and legends about the underground labyrinth. These legends are still popular. Back in 1930s, preparing for the impending war, several air raid and anti-gas shelters were built to Tallinn. 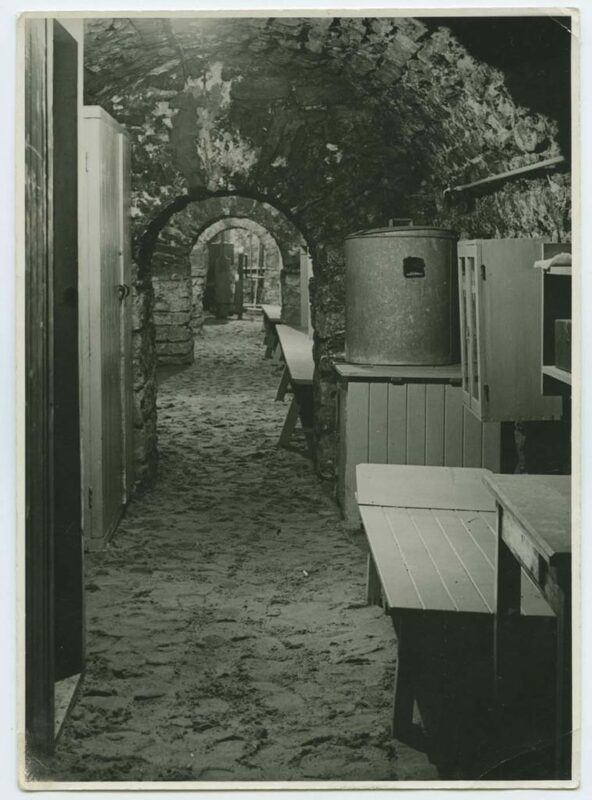 In 1936 part of the passages under the Ingrian and Swedish Bastions were cleaned from rubble and converted into anti-gas air raid shelter with state of the art ventilation and air sealed doors and thick layer of sand on the original dirt floor. During the WWII the shelter was used during the air raids and saved many lives. However, gas weapon was never used in Tallinn. During the Soviet era, in 1950s, the anti-gas air raid shelter got a complete overhaul, stone slabs were installed to the floors, independent ventilation and electricity systems installed together with telephone lines and pipelines for running water. The tunnels were equipped with toilets, three-level metal bunk beds, and all other necessary equipment to provide accommodation for people during a nuclear war. The nuclear war fall out shelter was abandoned in the second half of 1970s. In 1976-1977 the popular youth movement ‘Kodulinn’ (Home Town) carried out some cleaning of the passages. Some of the tunnel casements in the Ingrian bastion were used as a storage venue for several institutions up to the early 1980s, e.g. the sculptures of the Art Foundation were held there, some documents etc. The passages were not a safe place to storage anything due to occasional invaders and so the sculptures and other items from the casements used as storage were taken elsewhere and were no longer in any official use. So the punks hiding from the Soviet militia harassing them as well as some vagrants had tunnels for themselves. After the collapse of the Soviet Union, re-independent Estonia had many people who could not cope with rapid changes taking place and ended up in the streets. So from 1991 to 2004 the abandoned tunnels were populated by local homeless, who had set up camp over there and some of them lived there for over a decade. In 2004, Tallinn city started to renovate the tunnels to make them accessible for public.